Cara has been absolutely invaluable in growing the women’s cycling community in Iowa City. I owe my own start in cycling and racing to the efforts of both Cara & Sandy Kessler. Check back soon for an upcoming post about how these two teamed up to create the Women’s division of the Iowa City Cycling Club and started the Chamois Time Race Series. In the chaos of running a local race series, and organizing and coordinating other Iowa City Women’s Cycling Club events, Cara managed to earn her PH. D. in Epidemiology (way to go!) 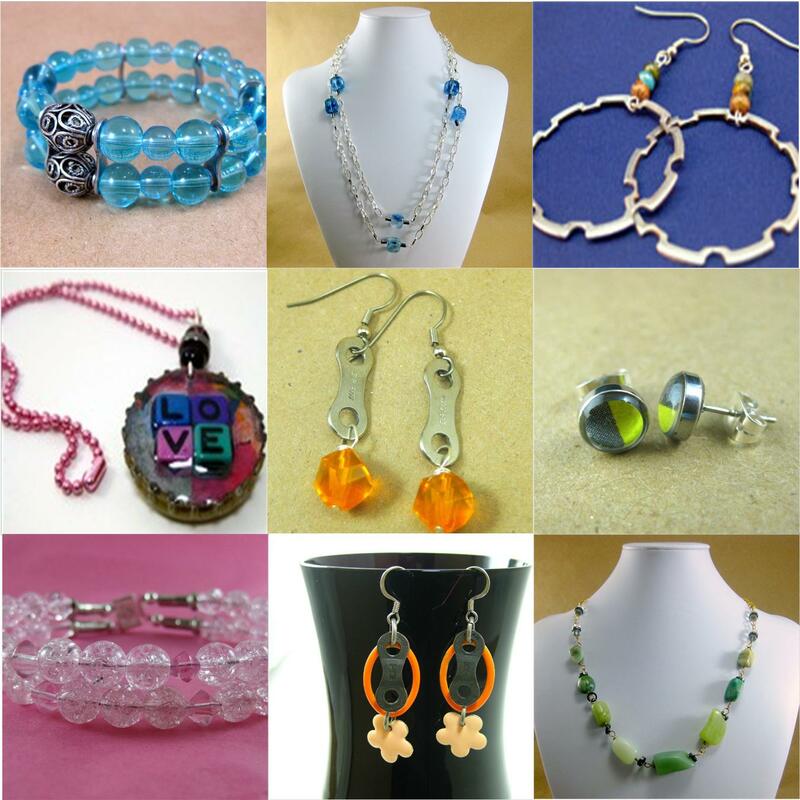 and start up CJH Recycled Bicycle Part Jewelry. She also happens to be one of the most down to earth and friendly people you will meet. And did I mention she is one tough competitor on a bike! Learn more about her below! Besides biking as a kid and commuting a mile back and forth to campus while I was an undergrad, I started out by doing triathlons when I moved to Texas to get my Master’s in 2003. I did that for about 4 years and then I think I did my first bike races in the form of a time trial series when I lived in Connecticut. I also did a little bit of mountain biking in both Texas and CT on my old college commuter crappy department store MTB (I had no clue back then how bad it was). Sometime while I lived in CT I did upgrade to a better MTB. I moved back to Iowa in 2008 and promptly got into all kinds of cycling, including road, cyclocross, and mountain bike racing. My boyfriend Brian was a big part of what got me to try those things out. I still did a few triathlons, but started focusing on biking and haven’t looked back. So, depends on how you calculate it. I didn’t really get into it until 2008, so 5 years, but if you include the triathlon/time trialing, I guess you could say 9 or 10 years. Raleigh 3-speed cruiser and an old Bridgestone mountain bike that I use as townies. I also have a Specialized Tarmac Pro road bike, Specialized Stumpjumper carbon 29er, Specialized tricross expert, Specialized tricross singlespeed, and a Surly Karate Monkey. Old Cap Crit—super tough, but super awesome feeling loved while racing around downtown Iowa City and having someone calling out my name on every corner. How has racing shaped your life? Cycling has made me tougher and more resilient both physically and mentally. It has provided me a way to connect and make wonderful friends. It has made me happier. The community it provides. Some of my best friends are those who I have met through cycling and cycle with regularly. Any goals for the end of this season or upcoming season? Get back in shape and get faster! Last year as I was finishing up my dissertation racing and riding fell to the back burner. With that behind me I am back in the saddle and ready to ride. What hobbies or interests do you have outside of cycling? I make recycled bicycle part jewelry, using parts that are saved from being thrown in the trash. I really like making jewelry. It allows me to be creative and it is fun to incorporate bike parts, makes it a challenge and a little bit green too. I also have a bunch of other hobbies/interests: reading, gardening, a little bit of knitting, taking walks and playing with our puppy, running, swimming, listening to music, cooking, and pretty much any type of arts and crafts projects. Editor's Note: View Cara's Jewelry website at http://cjhjewelry.com/ or stop by Geoff's Bike & Ski to see her jewelry in person! Any tips for women interested in starting riding or racing? I would just encourage women to dive in. Especially in the Iowa City area there is a lot going on in women’s cycling. Monday and Wednesday group rides and there are always women at the local races. Everyone is nice and always excited to see more women out there. A common concern we hear is that someone is afraid of being to slow or getting in the way during a race or ride. I would just say to not worry about those things. Overall, it is a welcoming community and we’d love to keep it growing! Thank you Cara for all you have done and continue to do for women's cycling in the area! I really do owe you for providing me an outlet to get a start in cycling though the group rides. I can't thank you enough for how much it has changed my life!! Very Nice! Cara you rock!